Nanna’s Storm was Indigenous author and painter Vicki Griffin’s first book. This is her second and certainly not her last, for her heritage inspires her artistic expression. 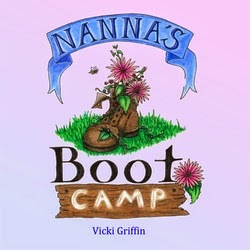 The four children are sent off to Nanna’s boot camp. They expect an adventure but don’t know what they will experience. Here boot camp takes on a new meaning. A huge boot hangs against the wind at the doorstep. Other dirty boots are piled up outside the tent. What does all this mean? Who owns these boots? Nanna and the mob wade into the creek. The net comes up full of prawns. They cook them over a campfire and the tale of the boots is heard. Uncle Joe arrives minus one boot. He claims the other from the wind and hook, and also catches his dinner of prawns. But he comes out minus his boots. They will now wait in the water for the dry season. Another pair of boots is added to the creek by Jacob. Now two pairs of boots await the dry season. That means a return to Nanna’s boot camp. This simple tale incorporates so much. It talks of family and love, sharing of oral traditions over campfires with the younger mob, and a sense of place and belonging. All this is told in picture book form in a fun-loving way for the 5+ years’ age group.